I made today's card for the Create4fun Challenge. This is my first time playing along, because I just found this challenge. I love the sketch they provided. I received this cute Sarah Kay image from a image swap, I am not sure what the name is, but I believe it is called "Rose Garden". Papers are from SU and DCWV. I embellished with lace ribbon, prima flowers, MS punched leaves and pearls, I also used my sewing machine and did some sponging around the edges to soften it a little bit. 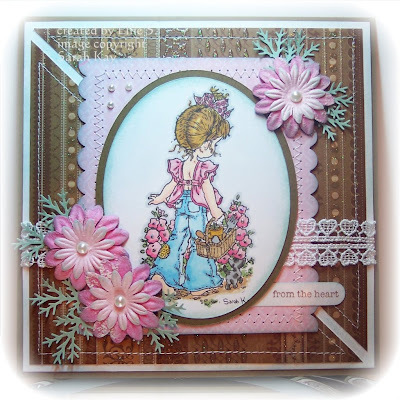 Thank you so much for visiting my blog today, hope you liked the card. The full recipe can be read below. This is so pretty, I love the colors of pink that you used with that brown. I also like the way you used that branch punch around the flowers. Wow your card is stunning, beautiful image and papers. I love what you use to embilsh with and the way you do it. How absolutely stunning!! What gorgeous work, Ellie!! OmGosh!!! I love this card!! and you no what's so cool. I just discovered these people today too..LOL! I thought the sketch would be fun to play with. You did a awesome job!!! Love it!!! A really pretty card. Great job.